My attempt to creatively demonstrate learning synthesis. 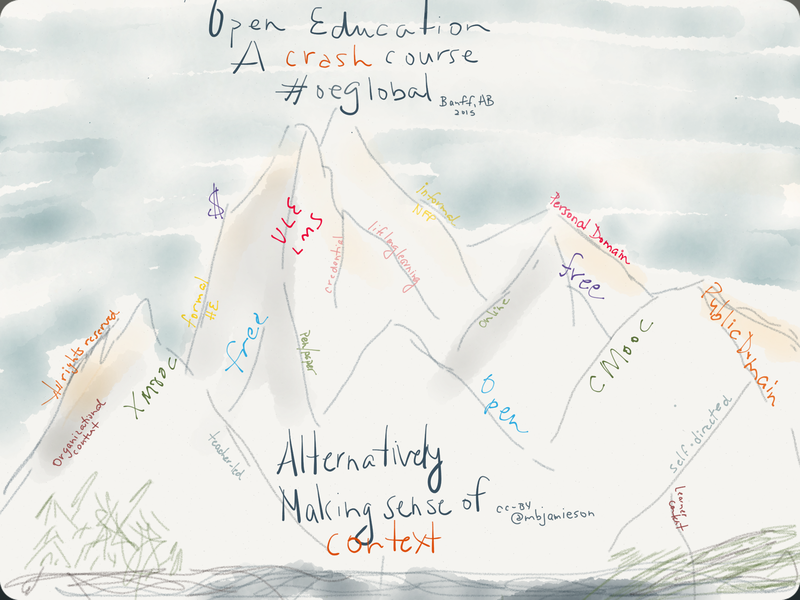 Today I attended the Open Education Consortium‘s, Open Education Global, Pre-conference session: Getting started with Open Education – a crash course on starting an open education project. The expert presenters each took a section of the day, Robert Schuwer, W.F. van Valkenburg, Martijn Ouwehand, Jure Cuhalev, Meena Hwang. Appreciated the collaborative note taking Google document; this also allowed for some back channel chat. The document will also include links to all of the presentation slides, which are full of the major points of the session. In trying to synthesize the learning from today, I decided to use the Rocky Mountains to frame the concepts that I feel have different ends and a variety of inbetweens. These are not new concepts to me, but I am still untangling how these concepts fit into Open Education 🙂 I know metaphors are a slippery slope (ha ha) but so is framing each of these concepts as an inflexible continuum, which a table or bulleted list will likely do (below). Tricky, inbetween there are a variety of Creative Commons licences that fall between. Lots of variety of approaches to Massive Open Online Courses, from approach, ownership of content, to technological choice. This was the differentiation between materials available for free access online, but not Open for reuse, remix, or redistribution. Discussion about revenue streams generated from having ‘free or open’ courses. This category is a bit ambiguous, and not sure where (if) it belongs. I don’t know that anyone spoke to learner generated content either. Choice in platform options. Personal domain wasn’t introduced, I have just added it as a possible other end. The discussion here was more about housing content in some type of Open Course Ware repository that could then be pulled into your LMS of choice. This was more implied given that I was there as the informal party crasher 🙂 (Note: I don’t like putting Life long learner (LLL) at the end of the ‘credentialed’ spectrum, as some off us LLLs also take credentialed classes. So what would be a more appropriate end to ‘credentialed’ <—> ‘for fun’? There was really no discussion about paper/pen forms of Open Education, except for the possibility of copying brochures. I am sure there is probably someone that has thought of a more comprehensive list of these considerations for moving Open; please let me know the references. For me, it was sometimes unclear where on the spectrum Open Education happens, or where the examples presenters provided fell between these categories. That is why I have re-titled the day to “Making Sense of Context for Open Education”. For me this is an important starting point. I particularly enjoyed the group discussion activities. It gave me the opportunity to contextualize examples in the real world. Sometimes we were not even on topic, but those tangential conversations were very stimulating. I might recommend that the conference have an activity for focused one-on-one attention for a specific time period (5 minutes, move to the next person…).